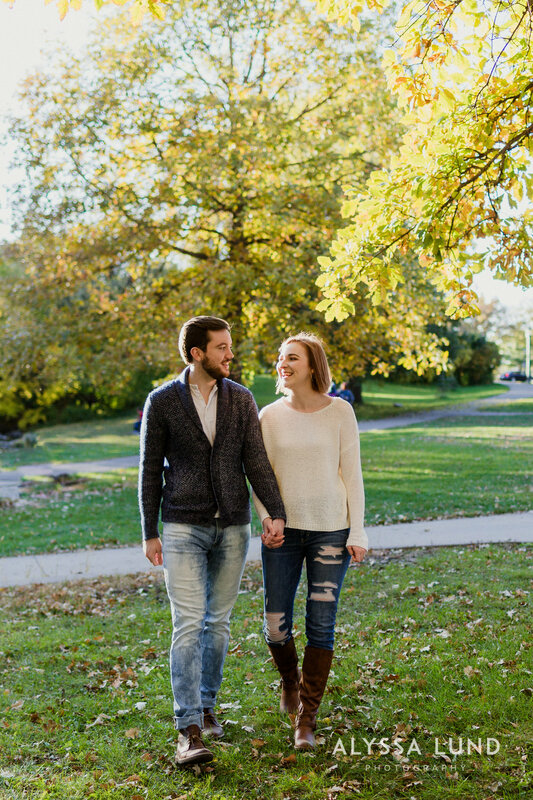 Jen and Eric planned an entire weekend to celebrate their first anniversary, ending with an anniversary portrait session at Minnehaha Falls Park. 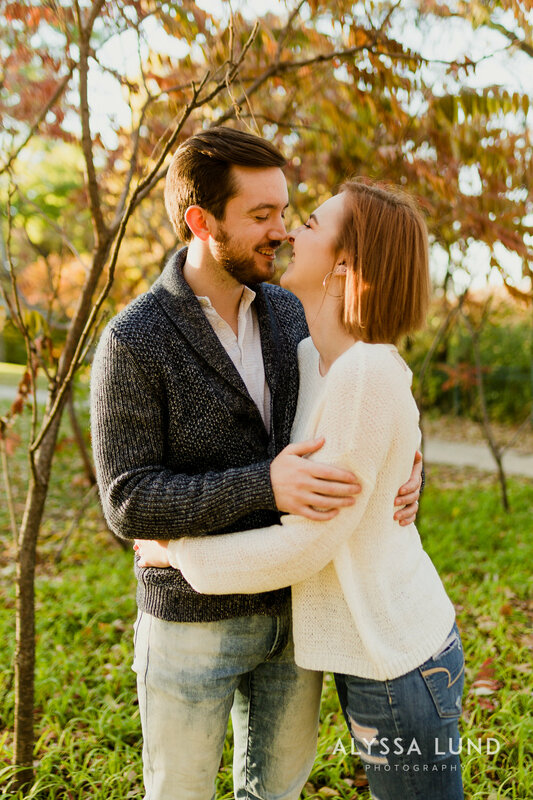 Their session was late in the afternoon and we had really beautiful golden light and fall colors to enjoy as we reminisced on their wedding day. They dressed in cozy sweaters that felt perfect and natural for walking around on a fall afternoon. One area of the park had a wooden arbor that added an interesting architectural element to their portraits and felt relaxed with the bright light that came through it. We also found a big hill with large oak trees that made for a very dreamy and atmospheric spot. The scene and light streaming through the trees made it feel like they were the only ones in the middle of this lush, autumnal forest. I loved all the warmth in this series of portraits!! When Jen and Eric came to their photo reveal in my home office they brought with them the news that they had just had an offer accepted for their first house together! It was super fresh and exciting they showed me pictures on their phones from the realtor posting - and we decided to plan a celebratory series of wall art for their new dining room area. They chose a trio of frames for their new space: two rectangular frames surrounding a square frame with a series of storytelling portraits all from the same scene, taken just moments apart. The champagne-colored frames, with their slightly metallic finish, fit in perfectly with their warm portraits to create a modern, cozy feel. 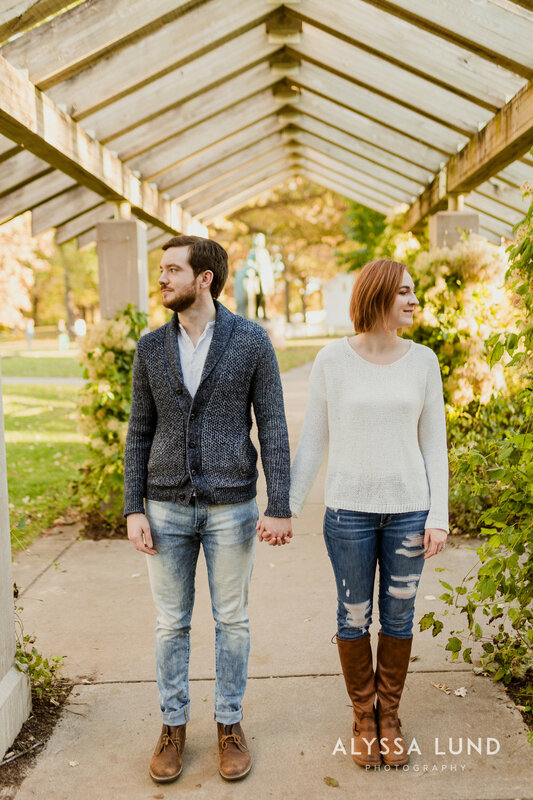 Jen and Eric, thank you for choosing to include a photo session in your anniversary celebration weekend. It was so fun to work with you both again, and I’m so so so happy that we could create this beautiful art for your new home!